Clicking the Purchase History link in the my eBay navigation area displays all the items you’ve won as far back as the last 60 days. The Purchase History page is the go-to place to check on any items that you’re waiting to receive. It’s also a convenient way to keep track of your expenditures, especially if you are buying for resale. If you do not see pictures next to your items, just click Edit, then Customize at the upper-right and make them appear. Listing title: A link to the listing. You can use this when an item arrives so you can be sure that the item you received is exactly as advertised. Item sale date and price paid: Helps you remember when you purchased the item. Estimated delivery date: Based on the seller’s mode of transit, eBay estimates how long the item should take to get to your door. If it hasn’t arrived within a day or so (barring snowstorms and natural disasters), it doesn’t hurt to contact the seller to check on the shipping status. 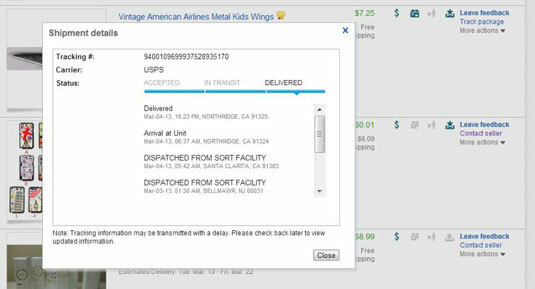 Tracking number: When the seller has shipped, and the seller inputs the tracking number to the transaction record, the number will appear in this area. You can click the tracking number to see the progress (or delivery confirmation) of your item. Contact Seller: This link sends you to the seller’s smart answers page. If you don’t see the answer to your question, you can send a message to the seller through eBay messaging. Return This Item: If the seller has a return policy, you can use this link to initiate a return and resulting refund. Sell This Item: If you purchased the item to resell, or just figured out you really don’t want it, click here and you go to a Sell an Item page. Icons: Each item’s listing has four icons that appear dimmed until the selected action is taken. 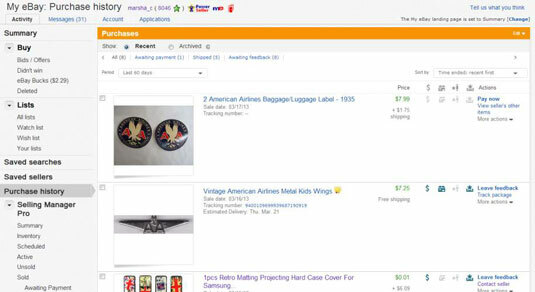 A dollar sign indicates whether you’ve paid for the item, a star next to a pen indicates that you’ve left feedback, a small package lets you know that the seller notified eBay that the item has shipped, and an envelope with a star on top indicates whether feedback has been left for you. eBay saves your transaction information for up to three years. Transactions made prior to 60 days can be viewed in your Archived purchase history. To view transactions from prior years, select the Archived radio button at the top of the list. Then, from the drop-down menu, select the year you want to view.